Plant roots foraging in the soil have to sense, transduce, and respond to fluctuations in water and nutrients plus a multitude of stresses to which they may be subjected. Biotic and abiotic stresses (including mechanical, salt, osmotic, and oxidative stress) trigger rapid and transient modulations in cytosolic and organellar free Ca2+ in plant cells. Recently, Ca2+ has also been implicated in signaling nutrient status and availability. While the involvement of Ca2+ as a second messenger in nutrient signaling is now beginning to be explored, few studies have examined the impact of nutrient deficiency on Ca2+ signaling per se. Thus, Matthus et al. (10.1104/pp.18.01469) set out to test how Pi starvation of Arabidopsis might influence the root’s use of Ca2+ as a signal, employing a range of abiotic stresses known to evoke robust, rapid, and transient [Ca2+]cyt signatures (mechanical, salt, osmotic, and oxidative stress). 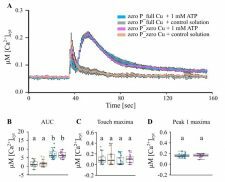 Additionally, as mechanical stimulation, salt, and osmotic stress increase the accumulation of extracellular ATP (eATP), which in turn transiently increases [Ca2+]cyt, they also tested the root response to extracellular purine nucleotides. By expressing the Ca2+-reporting photoprotein aequorin in Arabidopsis, the authors show that inorganic phosphate (Pi) starvation, but not nitrogen starvation, strongly dampens the [Ca2+]cyt increases evoked by mechanical, salt, osmotic, and oxidative stress as well as by extracellular nucleotides. These results indicate that, while Pi availability does not seem to be signaled through [Ca2+]cyt, Pi starvation strongly affects stress-induced [Ca2+]cyt signatures.